Here's another comfort food that's easy to prepare. 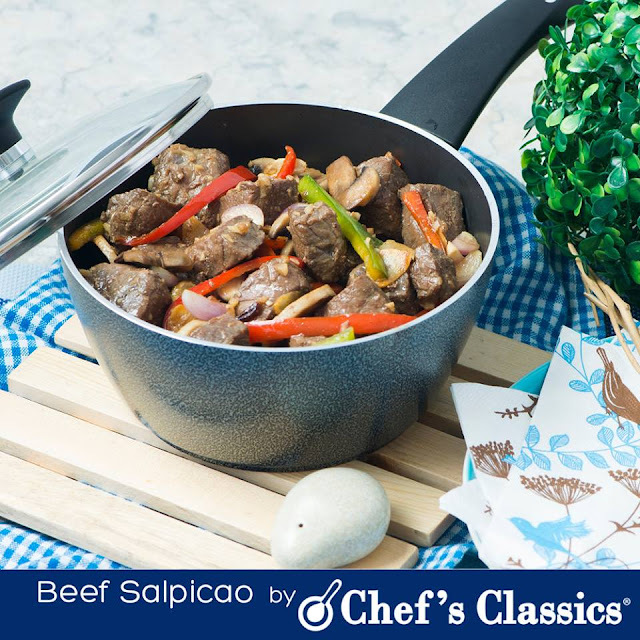 Get your ingredients ready because we share how you can get melts-in-your-mouth beef salpicao. Serve this at your next pool party or even for family dinner. 1. Mix beef, salt, pepper and garlic well. Let it stand for 10 minutes. 2. Add the olive oil and marinate for at least 30 minutes. 3. Heat the Chefs' Classics Melissa Sauce pan. Put in the combined ingredients once the pan is hot enough. 4. Sear the beef until the color of the outer part has browned. Try to toss the beef while searing, so that all sides are uniformly cooked. 5. Add the oyster sauce and Worcestershire sauce. Continue tossing until the liquid dries up. 6. Put in the butter and cook for 2 to 3 minutes more. 7. Serve for the whole family. Enjoy!